Exciting news is that Geo-coding is now available in the OMS when loading new property listings or editing existing ones. The location fields now include a Google Map with a red marker that pinpoints the location of the property. 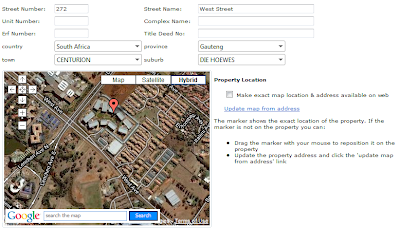 When loading a new listing, simply enter the address, select the town and suburb and click on 'update map from address'. The system will then use the address (including street number) to pinpoint the listing. The brochure layouts have been redesigned completely plus they are a bit smaller in size too. As before, brochures are automatically exported in PDF format. We are currently working on a number of new brochures, including more customized versions for commercial properties. Want your own custom brochure designed? Brochures: New brochure functionality is being launched and new template brochures will be added over the next week. We are also now able to offer custom brochures at more attractive prices and faster implementation time. 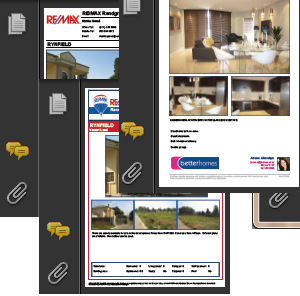 The brochures will be sleeker and offer functionality such as an option to show the property address or not. 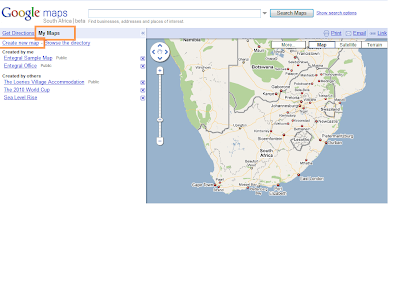 Geocoding: You will be able to geocode all your properties through the OMS. The exact location of the property will be displayed on a Google Map with the option to make this location available on portals and your website. You can even drag the marker location on the map!